Adventure and preparedness brand, Surviveware, offers affordable yet high-quality first aid kits that fit the needs of outdoor enthusiasts. Surviveware’s Small First Aid Kit is an Amazon’s Choice product in its category. This kit contains 100 -quality medical essentials that cater to a wide range of accidents and injuries. Surviveware’s kit contains bandages of varying sizes, adhesives, steri-strips, gauze swabs, and cleansing wipes. It also includes special first aid tools such as splinter probes, tweezers, a basic tourniquet, nitrile gloves, triangular bandages, and detachable CPR kit. 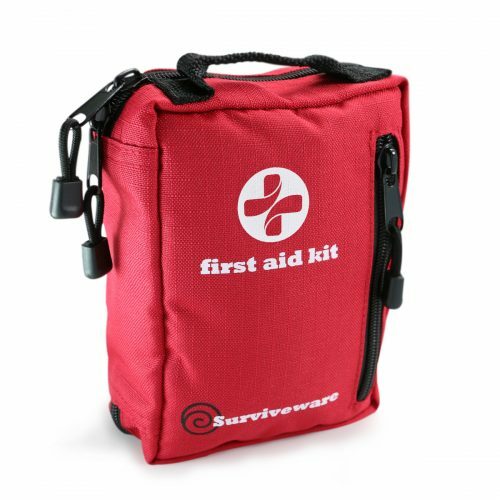 These life-saving provisions are encased inside a 600D polyester case and are secured with heavy-duty zippers. The contents are organized using labeled compartments, saving users time rummaging through the kit for the desired item, particularly when responding to a serious accident. The partitions keep the supplies in place and provide information on their use and quantity, so owners know which items need replacing at a glance. Another standout feature of Surviveware’s small first aid kit is its MOLLE-compatible strap system and heavy-duty top handles. These straps and handles make it feasible to attach the kit to almost anything- thereby making it accessible during any situation. It can also be strapped to bikes, roll bars, hammocks, backpacks, tents, hydration packs, and even on dog packs. The kit is compact enough to fit into a car glove’s compartment or office desk drawers. Despite its size, the kit can still hold additional supplies such as headlamps, combat tourniquets, or an Israeli bandage. Surviveware provides extra mini resealable pouches for users to store prescription medication. The quality and convenience of having a Surviveware Small First Aid Kit is evident in the product feedback written by customers. In the review written by Amazon Customer Isaac, he shared his observations on the first aid kit’s quality, usefulness, and economical pricing. According to him, the kit “… is exactly what I wanted. It’s got all the medical supplies for basic first aid and adequate items for serious injuries. The pouch is very compact, and it fits perfectly in backpacks, glovebox, and drawers. The construction of the pouch seems quite durable as well. I liked the fact that it came inside a resealable, waterproof bag as well. The medical supplies inside are very organized and easy to access with the labels. It’s perfect for a hiking and most other outdoor activities or just to have in your car. Your family deserves only the best. Make the most out of your money and more value for your family by purchasing this Surviveware’s Small First Aid Kit. Order it today for an exclusive 20% off your purchase by using Surviveware’s Amazon discount coupons. Hurry, limited slots available! Grab your kit today by clicking here.